Dark chocolate is great with almost everything ^^, I know that you agree with me. This time the chocolate comes with cream cheese in a cool form. I made a chocolate cheesecake before but I use less chocolate in that recipe. So this time I want to have more chocolate flavor in the cake (because more chocolate means that cake will be more delicious, ^^). Chocolate cheese cake can be additive, as I found the bitterness of the chocolate will be softer by the creaminess of the cream cheese and whipping cream. 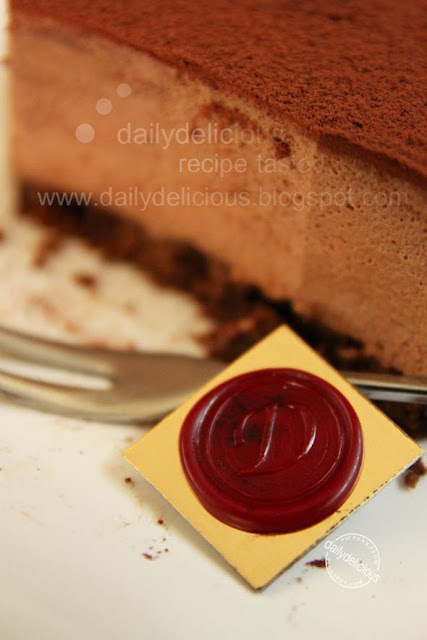 As always, the bitterness and the taste of the chocolate will come from chocolate that you use, if you want it to be on a darker side just use the chocolate with a lot of cocoa mass (and use less percent if you want milder ^^). 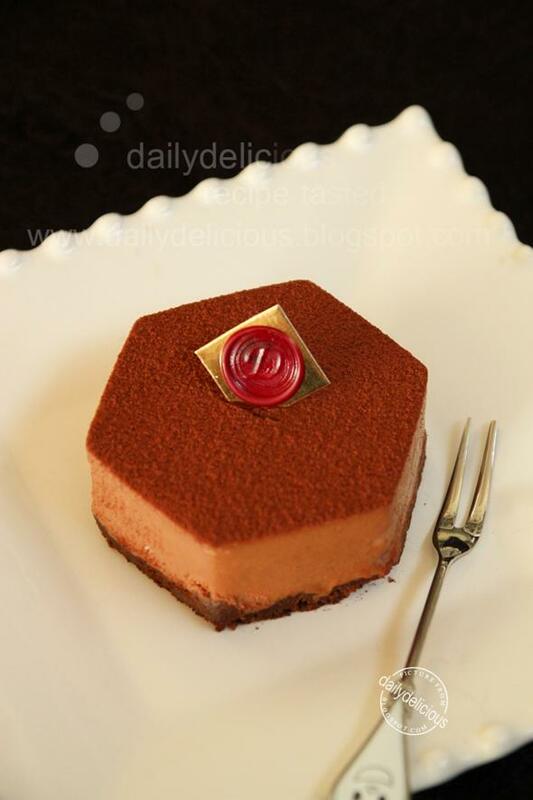 This cheesecake is very easy to make, as it doesn't require baking (you need to bake only the base of the cake). It falls into the rare cheesecake category, as it set by using the gelatin. 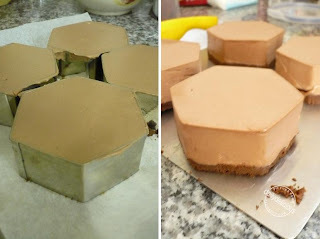 And you can use any molds for making this cake, I use a small hexagon molds (it's a cookie cutter, hehe, but I love it and the size is suitable for serving 1 person). 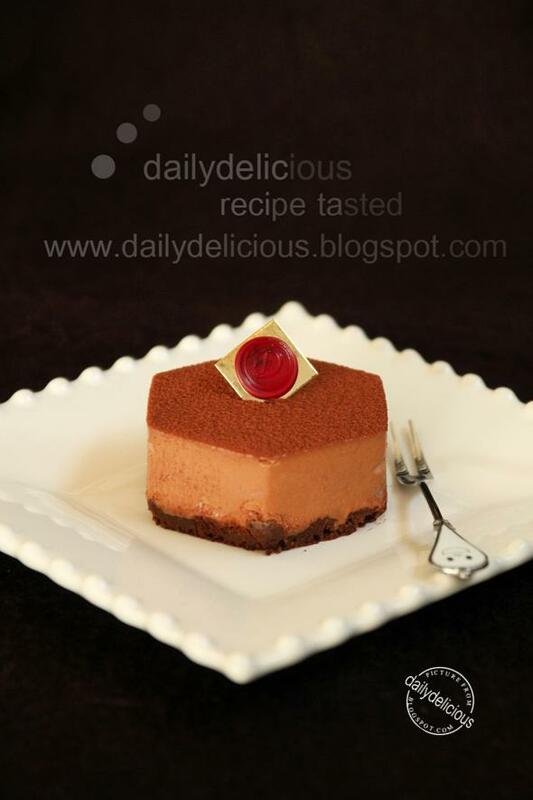 If you want to make cheesecake this one will be a great start, ^^, and beside from very easy to make this cake is very delicious too. Line the baking sheet with baking paper, place the hexagon mold on the baking paper. Mix the crushed biscuits with melted butter, then divide the mixture into the pan and bake for 10-15 minutes or until light brown. Let the base cool to the room temperature. Bloom the gelatin in cold water for 5 minutes. Warm 30ml of whipping cream in a microwaveable bowl for 40-50 seconds. Put the gelatin in the hot whipping cream and stir until melt. 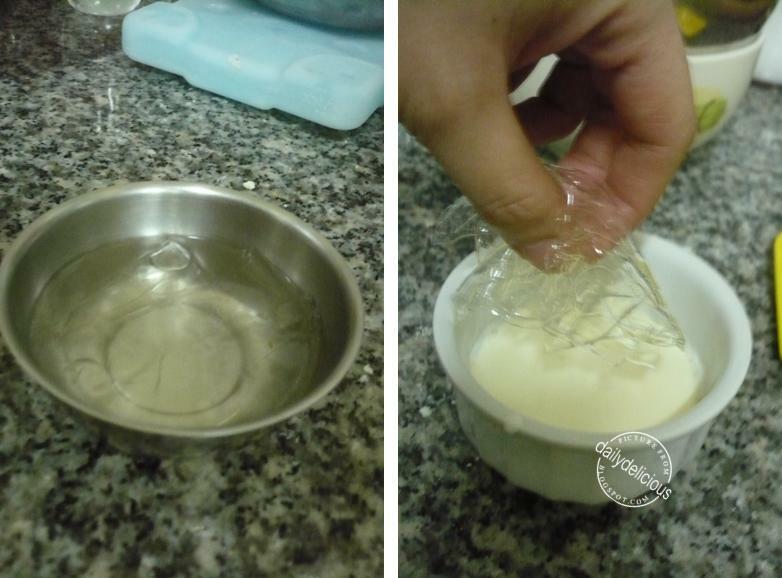 Beat cream cheese and sugar together until smooth, add the gelatin mixture beat to combine. Pour the melted chocolate into cream cheese mixture, beat to combine. Fold the whipped cream into the chocolate mixture in 2-3 additions, until fully combine. Pour the batter into the molds and smooth the top. Refrigerate until firm (4-6 hours). Take the cakes out of the molds and sprinkle with cocoa powder over the top. 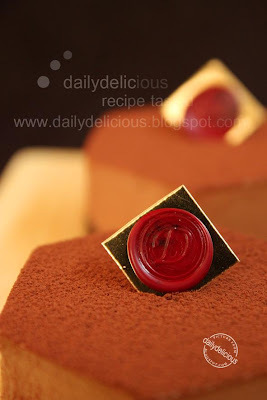 Gorgeous cheesecake, prefect for chocoholic person like me..
Ooh, those look so good! I've never made rare cheesecake before; I'll have to try it. you are very talented at making gorgeous desserts. This recipe looks amazing! When my recipes call for "Chocolate chips," I substitute them with "Xocai Healthy Chocolate." Their "chocolate" is full of "flavinols" and "Dark chocolate" has actually been proven to be good for you! Because "Xocai" "cold presses" all their "cocoa," the "good stuff" is preserved and packed full of "heart healthy antioxidants!" How did you make the little letter stamp decoration on this? I am having my chocolate cheesecakes in the refrigerator now... thanks for the great and easy to follow recipe! when baking the base, do we need to remove the mould? No, keep it in the mold, if take it out the base will spread. You can use blowtorch or warm towel to warm the side of the mold, then remove it, the cheese can will come out nicely. You can use gelatin powder. Just bloom it in 1tbsp of water using microwavable bowl, wait for 5 minutes and heat in the microwave for 15 minutes then add it in cream cheese mixture before adding the chocolate. put the gelatin powder into microwave for 15 min or 15 sec? Oh! yes, 15 sec, it's my fault. Hi, is it okie if i put the mixture in 20cm round pan or 20cm pan? Because i want to make one big cheesecake. Thank you very much, your recipes are amazing! Do you think this recipe can fit in 7" mould? Will it be a taller cake or shorter? I am thinking to make it for my Son birthday cake. Thank you. If using 7" you will get taller cake ^^.